If you’re brand new to the ukulele, you may be wondering about ukulele picks and which ones are best. Watch different people play their instruments on stage and on videos like the ones you can find on YouTube, and you’ll notice that there are a variety of techniques being used. Some players use finger picks for ukulele sounds that are very crisp, bright, and clear, while others use their fingers and a plectrum at the same time. We’ve read hundreds of reviews to bring you a robust list of the best ukulele picks, plus we’ve got plenty of insight to share about fingerpicking, felt pick ukulele playing, and more. Let’s get started! Ukulele picks tend to be a bit smaller than guitar picks, but that doesn’t stop people from wondering whether they can try different things. In fact, we’ve heard this question countless times: “Can I use a guitar pick on a ukulele?” The answer lies somewhere in the middle. 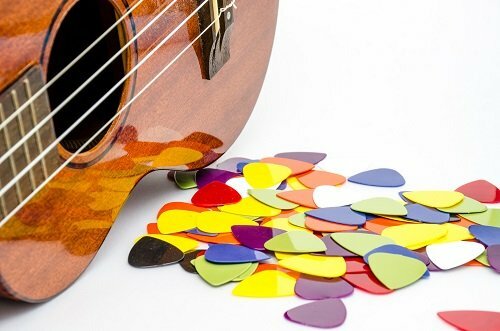 There are some who say that you shouldn’t even consider using a guitar pick for a ukulele, and others who believe that certain guitar picks can be effective tools for ukulele players. The main concern is that some guitar picks can cause scuffing to a ukulele’s top and wear the strings out a bit faster than a soft leather or felt ukulele pick. We should point out that the same thing can happen when you use your fingernails to play vigorously, and a little bit of wear and tear is normal when you play your instrument on a regular basis. Strings, after all, are consumable and need to be replaced when they start to show signs of losing their integrity. Next, it’s worth pointing out that a leather or felt ukulele pick addresses the scuffing problem and offers a softer, more traditional sound than a hard plastic guitar or ukulele pick makes. 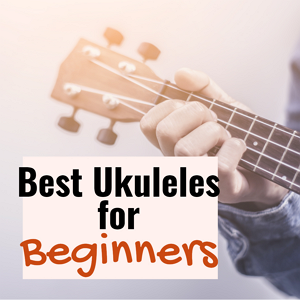 Of course it all comes down to a matter of personal preference and you might want to try a variety of picks or even try your hand at ukulele finger pick techniques to see what you like best when playing different styles of music. Experimentation, after all, is one of the keys to creative musicianship! 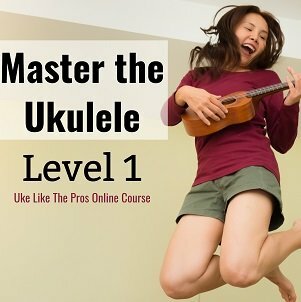 Ukulele fingerpicking is a fantastic technique to learn, and you can do it with or without the help of a ukulele finger pick and/or a ukulele thumb pick. This style calls for the use of multiple fingers on the dominant hand, and while it’s a little bit more complicated than basic strumming, it isn’t all that difficult. Fingerpicking can add a lot of variety to your repertoire, and fingerpicks can help you get the sound you want while protecting your fingers and thumb. Many players use their index finger, middle finger, and thumb to do the picking; it’s similar to the style used by bluegrass banjo players and fingerstyle guitarists, although it has been modified a bit to accommodate the ukulele’s size and string configuration. As for how to use fingerpicks for playing ukulele, there are a variety of ways to mix and match. 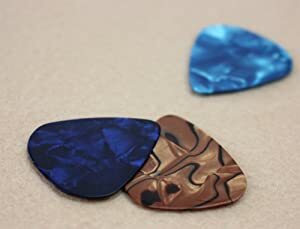 Some players use a thumb pick only, while others like to use a finger pick or even a complete set of picks. The takeaway? Picks help you create unique sounds with your instrument, and it’s always fun to see what you’re capable of. Playing the Ukulele: Pick or No Pick? Wondering whether to play ukulele with a ukulele pick or fingers? You’ll get interesting results no matter what you do. In general, playing with harder picks will add volume and spare some wear and tear on your fingers, especially if you like to play fast, energetic music. If you want a softer sound minus the signature rhythmic clicking sound that can happen with a plastic pick, then try playing with a rubber, leather, or felt pick. 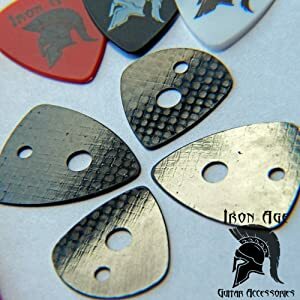 Most experienced players have a variety of picks that they use for different types of songs and different styles of music. And most picks are very inexpensive, meaning it shouldn’t hurt your budget to try a variety and see what appeals to you. Smaller and softer than a traditional felt pick, the BoloPick Felt Pick is very easy to use, and it provides a soft, mellow sound that’s just right for playing traditional tunes. BoloPicks come in a variety of different colors, and convenient 6-packs mean that you always have a pick on hand when you need one. These sound great with nylon strings. They soften the tone without really affecting the volume. The Bolos give nicely and they feel good between my fingers when I play. These cost a little bit more than some other ukulele picks I’ve tried, but they sound great, feel good, and will last a long time. The picks felt a little coarser than I expected but that might be because they need to be broken in. Although they seem durable, random felt fuzz comes off on my ukulele sometimes. This set of shell-colored finger and thumbpicks offers a nice island vibe, and they’re suitable for use with any stringed instrument. Dunlop 9020TP ukulele finger picks let you experiment with different techniques without making much of an investment. Overall, these are nice picks, especially for the price. The sound is great, not nearly as chirpy as metal fingerpicks. You will get a nice mellow sound and no buzz with these picks. The color and look are exactly what I wanted. 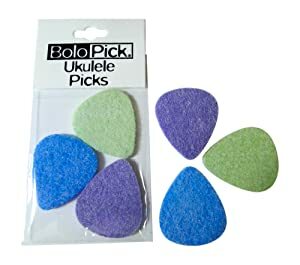 Made with genuine wool felt for soft, mellow tones, these ukulele picks come in a handy 3-pack and feature the company’s attractive logo in blue. 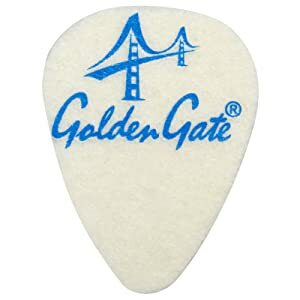 Designed for use with nylon strings, Golden gate FP-1 ukulele felt picks are ideal for creating a loud, consistent strum. These picks protect my skin and nails while providing a nice, warm sound. It’s easy to get a good grip on these felt picks, and they’re tough enough to last a long time under normal playing conditions. High quality, and easy to play with. If you strum hard for hours on end, you’ll wear these out fast. These are nice, but the sound isn’t as crisp as what you get with a plastic pick or a fingernail. This 8-pack features synthetic felt picks for an authentic Hawaiian tone. Island-inspired colors including blue, pink, green, and purple make them fun to use. Kailua ukulele felt picks deliver a softer sound than metal or plastic picks. These picks make a nice, natural sound. My daughter loves the colors. These picks are thicker than regular plastic ones, making it easy for me to hold onto them. These feel a bit harder than I expected. I wish they didn’t shed. These patented premier leather ukulele picks sound as close to fingers as you’ll get. 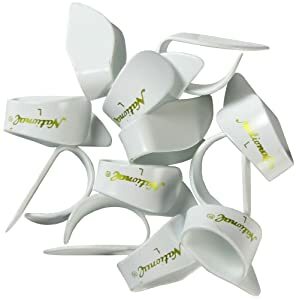 Ergonomically designed to reduce thumb and finger fatigue, they are ideal for players with long fingernails, neuropathy, or arthritis. 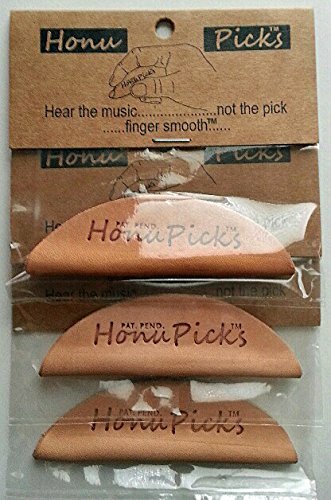 HonoPicks leather ukulele picks come in a convenient 3-pack. These are the best sounding and most comfortable ukulele picks I’ve tried. These picks sound completely natural, just like playing with your fingers, and the ergonomic design is perfect. You’ll get clear tones, even with slow strumming. They were a bit stiff and hard to hold at first, but are perfect after a bit of leather conditioner. I had trouble plucking, but felt OK with strumming. If you’re not sure what size ukulele picks to get, consider this handy six-pack from Hilo Ukuleles. Each package contains picks in two different sizes so you can choose what feels best. The natural color complements just about any instrument. The picks are nice and don’t leave any color behind on my strings. These picks have a rounded edge and a flat edge, so you can use them different ways. It’s nice to have different sizes in the same pack. The picks were stiffer than I expected them to be. 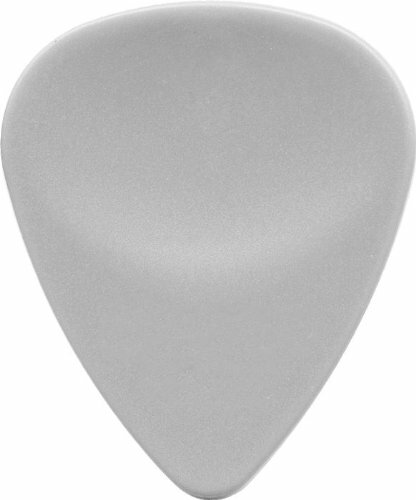 A slightly concave shape for a great grip makes these unique picks comfortable to play with. The soft rubber material offers a natural sound similar to what your fingers make, so you can enjoy warm, clear tones. 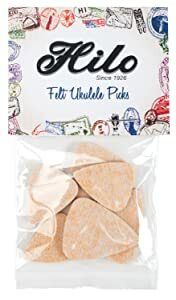 This pack of soft wedgie rubber ukulele picks includes one soft, one medium, and one hard pick so you can create a variety of sounds. This is fantastic, it plays like a pick but sounds like your fingers. If you want to pick individual notes, you’ll like the way this works. You’ll get a louder sound with these picks, but without the hard plastic clicks. Not the best for strumming, but good for picking. These picks grab the strings a bit and they can leave little flecks of rubber behind. Shaped like traditional ukulele picks but made with soft synthetic leather, Iron Age ukulele leather picks produce a bright, pleasant tone. These picks are suitable for any stringed instrument, and are durable enough to stand up to steel guitar strings. Packed in a convenient reusable pouch, these Iron Age leather uke picks come with a bonus hanger strap. The synthetic leather looks nice and feels great in your hand. You get a bright tone for lively-sounding music. These make a softer, more traditional sound than plastic. Good quality, but a softer feel than I was used to. These aren’t made with real leather. 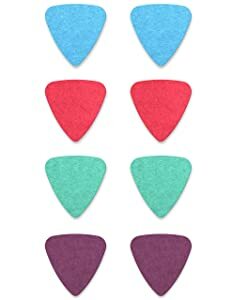 If you’re looking for a very crisp sound and you’re accustomed to holding a guitar pick, then you may like these ANKKO Thin Guitar / Ukulele Picks. In a convenient 20-pack with lots of bright colors and patterns, they’re suitable for playing a variety of stringed instruments including ukuleles. I got these for my granddaughter and she loves all the colors. These are quality picks for the money. These picks are good for beginners. The shipment took a while to get here. The color assortment was more boring than the photo. If you decide that you’d like to use ukulele thumb picks only, then you may want to check out this National NP-8W Thumb Picks value pack. Designed for comfort and durability, these picks come in white, black, and shell colors to suit your taste. These are comfortable and they allow for faster playing. Perfect for accentuating bass notes. Nice for nylon ukulele strings and strong enough for steel guitar strings. Great picks, but they’re not suitable for every playing style. These are nice but you may have to resize in hot water or use a blow dryer to soften the plastic for a good fit.